Lonar - Of Demons and temples with eight shadows ! The Next day we decided to take a break from History and visit the Lonar Crater Lake. 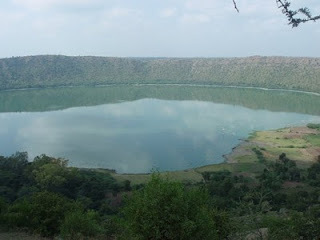 Lonar crater was formed by the impact of a 2 million ton meteorite hitting the earth about 50,000 years back. It’s the third largest and oldest meteorite crater on the earth. Along with the obvious scientific significance the lake has also has some ancient temples around it. We left the hotel bright and early and picked up our guide on the way, a young man called Anand Mishra. We were told that he belongs to Lonar and has done some great research on the lake. As we left the city, the buildings and chaotic traffic slowly gave way to small villages and cotton fields. Deccan soil is the rich black variety ideal for growing cotton. We all wanted to stop at the fields but Anand promised that he would take us to the cotton fields at Lonar where we could gallivant all we want ! We did make a stop at a roadside Dhabha though to hog on very tasty moong daal vadas and pakoras. Lonar is a small village about three hours away from Aurangabad and for a place of such scientific significance it’s rather underdeveloped. There was just the lake with a smallish Dhabha near it. A lot of nomads were camping in the open ground nearby blissfully unaware of the importance of the place they were in! The first thing we all did after getting off the bus was to go to the edge of the hill and peer down at the crater. It was like looking down on huge bowl filled with bright Greenish- Blue water surrounded by an emerald ring of trees. To reach the rim of the crater we had to trek down the hill over a very uneven and steep path. Some of us managed to climb down with the ease and nimbleness of a goat while some like me huffed and puffed and sweated our way down. Once we reached the lake, we realized how lucky we were to get Anand as our Guide. He is a self taught man and has done some commendable research on the crater. His expertise is now so great that he has a fellowship with NASA and regularly helps the various researchers from NASA and other countries who come to Lonar. His in- depth knowledge spans the realm of geology, astronomy, ecology to mythology and he explained everything to us with great passion and good humor. Anand explained how the lake has two distinct regions alkaline and non alkaline. He demonstrated the Ph levels in the lake by dipping a ph strip in it which instantly showed very high ph levels. After giving us some more scientific information about the lake, Anand decided to enthrall us with some mythological stories and told Little Ashi, all of ten years, the story of the demon Lonasur who is supposed to live in the depth of the lake. Ashi spent all her time looking for the demon hoping to have a tete a tete with him so that she could go back to Delhi and tell her friends how she saw a real demon! We also visited a few temples dotting the lake.The first temple we saw was an ancient Shiva Temple built in the Hemadpanthi architecture style. But temple I found the most interesting was the Temple of Lord Ram. Lord Ram is supposed to have performed the last rites of his father over here.The most intriguing fact about this temple is that where ever you stand inside the temple eight shadows are formed. Anand demonstrated it to us and then all of us tried it by standing at various spots in the temple. It was fascinating and eerie at the same time. The reason for this magic is the pillars that support the temple. They are built in such a manner that they act as a sort of prism for the sunlight filtering through giving rise to not one but eight shadows. Anand also showed us the magnetic effects of the different rocks in the temple by moving his compass on the temple floor. At certain places the compass changed direction i.e actually showed North as South ! The lake is surrounded by a thick forest area largely untouched and unspoiled by man and is supposed to have some interesting flora and fauna. But I was not interested in any of it. My only desire was to see a snake. Now, I have never ever seen a snake in my life, a statement that was greeted by much shock and hilarity by other members of the group. I have only seen snakes hidden deep in the boxes carried by snake charmers roaming the streets and they hardly count ! what I really wanted to see was a snake in its natural environs. Anand had gallantly promised to show me a snake but then he had also promised to show Ashi the demon! But I guess I was luckier than Ashi ! On our way back, we were all walking almost one behind the other, when suddenly the people walking ahead stopped dead in their tracks and excitedly pointed towards a clump of trees.And there it was - a beautiful snake just a few feet away! It was a young cobra, its skin shining and glistening in the sun. It stopped for a moment, looked at us with what I imagined to be utter indifference and disdain and then slid past with fluid like grace. It was a fantastic sight! The woods were also full of Langurs, great packs of them sitting on trees and even under them. Three very wise looking langurs were sitting under some trees as if holding a conference. They did not seem at all pleased with our intrusion ! We also saw some very interesting spider webs on the bushes with huge spiders inside them. Another arduous climb up, and then we fortified ourselves with food that Piya had so thoughtfully got packed from the hotel. After Lunch we finally stopped at some cotton fields on our way into Lonar town. The fields were surrounded by huge teak trees- beautiful trees with large shiny leaves that we eventually turn into furniture ! The cotton flowers were in full bloom and the cotton peeping out of the pods made the plants look as if covered with snow. It made me feel like Scarlett o Hara at Tara. I guess the only thing missing was Rhett Butler ! At Lonar we visited an ancient temple. The temple itself was rather insignificant, but had a man made waterfall with water falling from an outlet fashioned like a demon’s mouth.We were really hot and dusty after our trek to the crater so some of the more adventurous of us decided to cool themselves by standing under the waterfall in true Hindi filmi style while the rest of us contended ourselves by just rolling up our jeans and walking about in the water. The temple is at a considerable height and we had a fantastic view of the Lonar lake from there. 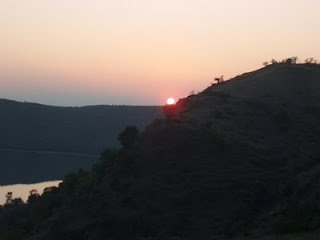 We watched a spectacular sunset over the lake before finally making our way back to Aurangabad. Although not a very well known or popular tourist spot in India,Lonar has something for everyone - Geologists, ecologists, archaeologists, naturalists and astronomers. It was definitely worth the visit ! "we turn your good vacation into a great vacation"